President Donald Trump addresses a joint session of Congress on Capitol Hill last year in Washington. His aggressive stance on tariffs with China and Canada is causing havoc with markets worldwide. 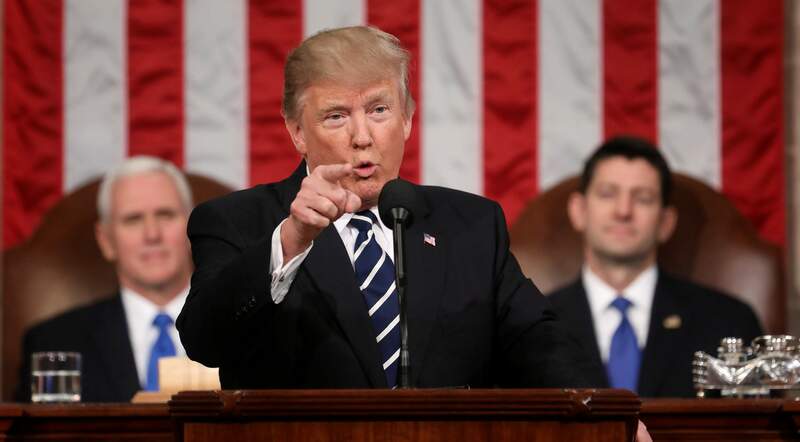 Controlling trade is one of the ways President Donald Trump intends to fulfill his campaign slogan, “Make America Great Again.” By levying tariffs on the importation of goods that can be produced in the United States, he hopes to save U.S. jobs and bolster the prices of U.S. products. Trade policy is far from simple, and the Trump administration, understaffed and resistant to information that does not support the president’s plans, may not foresee the way such policies play out on down the supply chain and throughout the domestic economy. An early example of that was layoffs by a beer-keg manufacturer. Import tariffs on steel raised domestic steel prices, which raised the cost of manufacturing kegs, No similar tariffs were levied on Chinese steel beer kegs, which now are less expensive than those made in the United States. One import tariff, which ironically has not received much news coverage, is a tariff of as much as 32 percent on Canadian-produced newsprint – the paper on which newspapers are printed. According to the Colorado Press Association, a preliminary U.S. Commerce Department investigation has determined some Canadian companies are underpricing newsprint as a result of Canadian government subsidies. The dumping of Canadian paper in the United States harms U.S. paper producers by holding prices down; it also aids newsprint consumers in the same way – by holding prices down. If the U.S. government imposes a tariff that raises prices to the extent that the demand for newsprint drops, that also harms U.S. paper producers. The newspaper industry is already pressured by the proliferation of free online news outlets, supported solely by advertising sales. That funding mechanism is a two-edged sword that rewards those companies for reporting news that pleases, or flatters, advertisers. The sale of individual newspaper copies and subscriptions, and the existence of paywalls that require readers to bear a fair share of the cost of news-gathering and editing, bring readers’ interests to bear on the demand side of the equation. That’s especially important in places where only a few news agencies are available to provide residents with the information they need to make informed choices about their businesses and their lives, and to engage in the public sphere via letters to the editor and local columns on the opinion pages. Small-circulation newspapers (and local radio stations, which face different challenges) often employ the only reporters focusing their investigative skills on small and rural communities. Untangling complex stories requires training. Collecting, processing and publishing meeting notices, business, event, birth and death announcements, high school sports coverage and photography that brings stories to life – also requires staff time and newsprint space. If newsprint costs rise precipitously, news staffs will shrink and the quality and amount of coverage will decline. That’s not good for a community or a country. Publishers and printers have banded together to lobby against high newsprint tariffs, and they’re asking for support from people who consume their products – not sheets of newsprint, but well-researched, well-written and well-edited news coverage and community information. Please urge the administration to think their tariff decisions all the way through, because the effect does not stop with the producers of raw materials. It trickles all the way down through mid-level manufacturers, retailers and consumers. Tariffs can raise prices and cost jobs throughout the economy, and the jobs they save are not likely to be in small communities like ours.